CruiseJobFinder interviewed the CEO of The CTI Group, a staffing agency which services Carnival, Norwegian, Royal Caribbean, Disney, Costa, Crystal, Louis, and Windstar cruise lines as well as The World. They also provide services to many land-based organizations. Don't miss Part II of this interview, which discusses preparing your CV for cruise lines and interviewing tips. Please describe what your company does for cruise lines? What is your role in the staffing process? CTI Group has been providing talented staff and crew for the cruise industry for over 19 years. From our world headquarters in Ft. Lauderdale, Florida, CTI Group coordinates with our international branch offices. We have a total of 8 global offices located in Thailand, Indonesia, Myanmar, Philippines and London, UK. Each office has a special relationship with local business owners, culinary and trade schools, as well as government and embassy officials. As an experienced leader in staffing for the cruise line industry, CTI Group ensures a seamless processing of crew personnel. Recruiting only the most qualified applicants, CTI Group also specializes in arranging travel for their hired employees from anywhere in the world. What types of jobs do you recruit for? Is there a particular department or role? CTI Group recruits for a wide range of positions and departments. Whether it is a back of the house role or guest-facing, we continue to source experienced crew to meet the growing needs of our clients. Opportunities abound in such departments as Food and Beverage, Housekeeping, and Deck and Engine. For this reason, we are always looking for talented Chefs and Cooks, Wait Staff, Bar Staff, Cleaners, Laundry Staff as well as all levels of Marine and Technical. Experienced leaders to manage the onboard operations are always in demand also. Are some types of jobs more difficult to fill than others? If yes, then why? It all depends on supply and demand. Many of the cruise lines are expanding their fleet with megaships that need more crew to accommodate the increased guest count. That being said, jobs in culinary seem to be most in demand, as well as licensed deck and engine crew and officers. Multi-lingual candidates also are needed for many of the guest-facing roles such as in the Front Desk (Purser) and Merchandise departments. The good news is that it's a great time to launch a career within the cruise industry! What services do you offer the people who apply through your company? CTI Group offers a full range of services to prepare our candidates for their shipboard career. Depending on our clients' requirements, we guide a candidate through the whole process. Providing individualized treatment makes it a lot less intimidating for our candidates. Specifically, some of our services include teaching interview presentation skills, English improvement classes, familiarization on the cruise industry culture and lifestyle, pre-employment documentation handling (medical, visa, corporate training), post hire communications, booking their flights, and so much more. 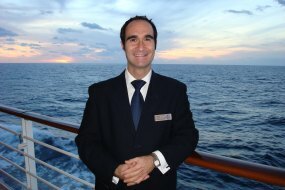 Are there any common traits people should have in order to get hired, and then to succeed in the cruise industry? A service-oriented mentality is critical to succeed in the cruise industry, regardless of the position. Cruises are all about making wonderful vacation memories for their guests. Every role onboard supports this overarching mission. In addition, flexibility is also important as many things can change quickly onboard due to the weather, guest needs and operational demands. Since most cruise lines have multiple nationalities onboard, having an open mind and team approach will also help ensure a successful path. Of course, it's important that the individual is prepared to work, and work hard! Those with a positive and can-do attitude will most likely find a good home within the cruise industry. What are the typical terms of employment offered? For instance, contract length, pay rate, etc.? The terms of employment differ from each cruise company and from each position. Most commonly, contracts are 6 to 8 months onboard with two months off (for crew); officers may have shorter contracts. Pay throughout the industry is fairly competitive. One cruise line may offer a higher monthly pay but the crew member is responsible for their joining tickets. Another company may be slightly less in pay but offer a signoff bonus. It really depends. A candidate has to look at the total compensation (pay, benefits, contract lengths, onboard privileges, etc.) to determine which company is most attractive for them personally. Don't Miss the Rest of this Interview! Should you pay a fee to staffing agencies? Are there official cruise line hiring agencies in your area? What are the most common and worse resume/CV mistakes? What are the best methods of applying for jobs with cruise lines? Use CruiseJobFinder to help your find your dream job. There are thousands of open jobs right now. Simply click the button below to start your job search.